Tunnelling officially began in 2012 and now, in 2017, the 26 miles (42km) of 6.2 diameter rail tunnels have been completed and the track has been laid beneath the bustling streets of London. A total of eight tunnel 1,000 tonne boring machines (TBMs) worked their way through the earth, weaving through the existing tub network, sewers, pipes, and utility of up to 40 metres deep ending at Farringdon when tunnelling machine Victoria, named after Queen Victoria, constructed the remainder of the tunnel. Victoria bore through her last bit of earth on 26 May 2015. A total of five different types of track have been laid throughout the tunnels with approximately 80% of track, a total of 41.2km, in the central portion being standard track slab. Direct fixed track, high attenuation sleepers, floating track slab light, and floating track slab heavy make up the rest of the track. Each type of track brings its own advantages. Among the most prevalent benefit is noise and vibration reduction. Throughout the upcoming year, the railway will come to life as over 15,000km of cable are installed in the tunnels, delivering power, lighting, and communications systems. 18 locations throughout the route will be fitted with a total of over 4km of full height platform edge screens. These vents will help to encourage air circulation and regulate temperature. The Elizabeth line will have a total of ten stations, each with its own style and character to showcase the surrounding environment and history of the local area. Common design characteristics will remain the same throughout each station, to include: seating and signage in order to maintain a cohesive, comfortable feel. We’re so excited for this final year of construction and design. 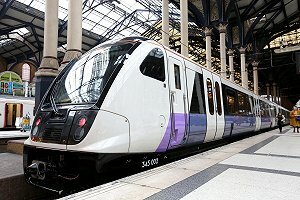 The Crossrail programme not only promises to improve air quality and reduce energy consumption, it has also provided jobs for over 15,000 men and women to the tune of 100 million working hours. As of now, the project is due to be completed within the £14.8 budget and on schedule.